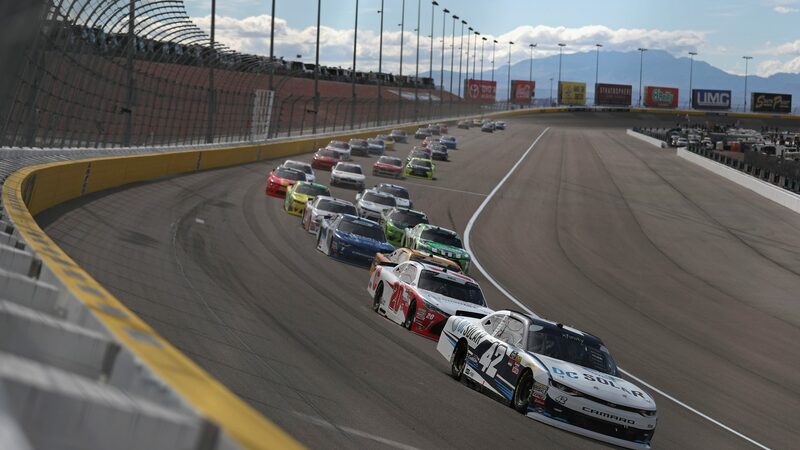 NASCAR will this weekend travel to Clark County, Nevada for a triple header at Las Vegas Motor Speedway. NASCAR Camping World Truck Series, Xfinity Series and Monster Energy NASCAR Cup will all race this weekend. Las Vegas Motor Speedway opened for racing in 1972 (drag strip and road course) and the 1.5 mile oval opened in 1996. The track is a tri-oval Superspeedway and is 2.41 km (1.5 mile) long. Surface is asphalt with four turns. Banking in corners; 20°, front/back straight; 9°. Track record, for NASCAR Series, is held by Kurt Busch with 196.328 mph (27.505 sec.) in 2016. The driver with most wins, in NASCAR Cup Series, is Jimmie Johnson with 4 wins (17 races). The stands currently capacity are around 80 000 seats. Bonus fact: Greatest Margin of Victory: 9.104 seconds – Matt Kenseth over Dale Earnhardt Jr., 3/2/2003.